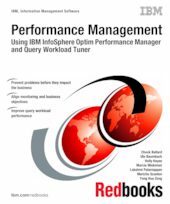 This IBM® Redbooks® publication describes the architecture and components of IBM InfoSphere® Optim™ Performance Manager Extended Edition. Intended for DBAs and those involved in systems performance, it provides information for installation, configuration, and deployment. InfoSphere Optim Performance Manager delivers a new paradigm used to monitor and manage database and database application performance issues. It describes product dashboards and reports and provides scenarios for how they can be used to identify, diagnose, prevent, and resolve database performance problems. IBM InfoSphere Optim Query Workload Tuner facilitates query and query workload analysis and provides expert recommendations for improving query and query workload performance. Use InfoSphere Optim Performance Manager to identify slow running queries, top CPU consumers, or query workloads needing performance improvements and seamlessly transfer them to InfoSphere Optim Query Workload Tuner for analysis and recommendations. This is done using query formatting annotated with relevant statistics, access plan graphical or hierarchical views, and access plan analysis. It further provides recommendations for improving query structure, statistics collection, and indexes including generated command syntax and rationale for the recommendations.